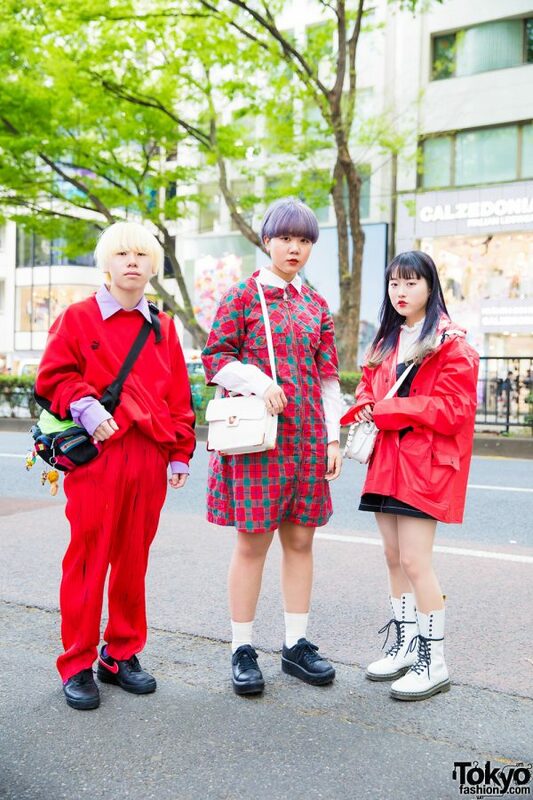 We spotted this stylish trio of 18-year-old students, whose all-red outfits caught our eye on the streets of Harajuku. In the middle is purple-haired Ayano in a vintage Kinji plaid zip-up dress. She styled it with a vintage Kinji white long-sleeved top, white socks, and vintage black lace-up sneakers. Red lips, multiple ear piercings, and a white vintage Kinji shoulder bag completed her look. 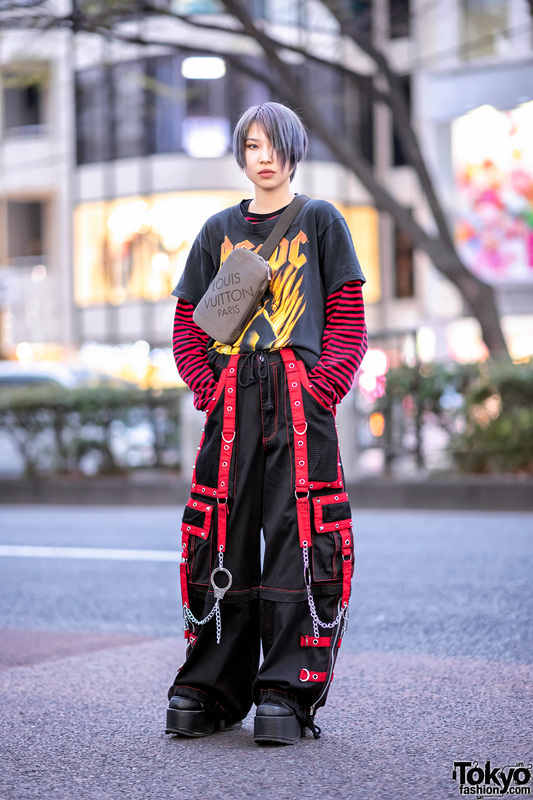 Ayano’s favorite fashion brand is Vivienne Westwood, while Kenshi Yonezu is her favorite musical artist. For more on Ayano, follow her on Instagram. 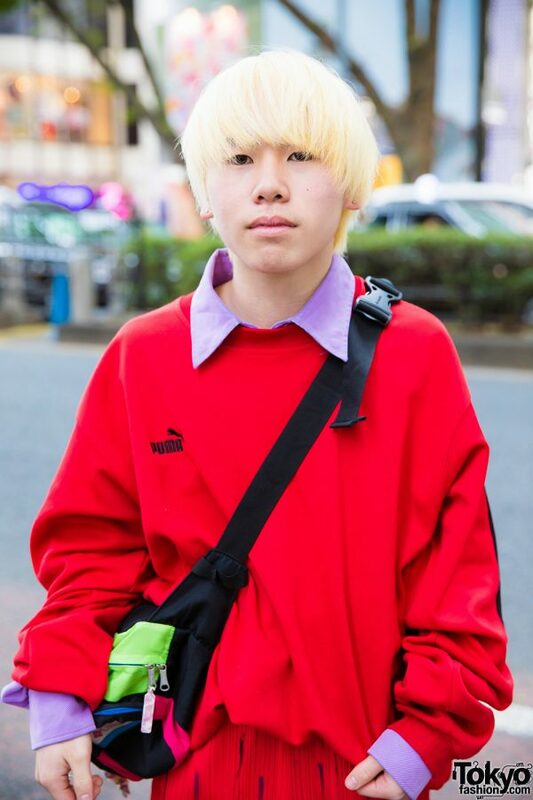 On the left is Syozo, who donned a bright red Puma sweater over a purple collared long-sleeved top. 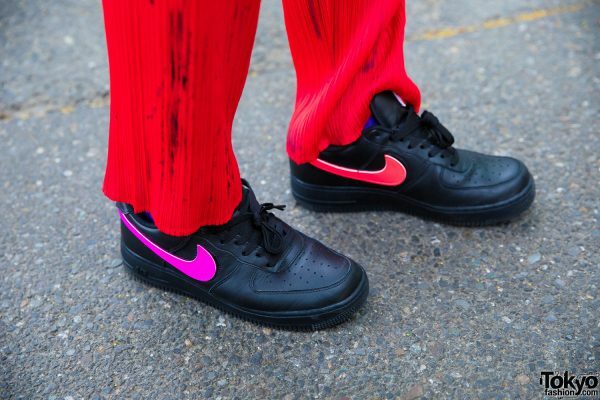 He also wore bright red pleated pants from Issey Miyake and Nike Air Force 1 Swoosh Pack black sneakers. 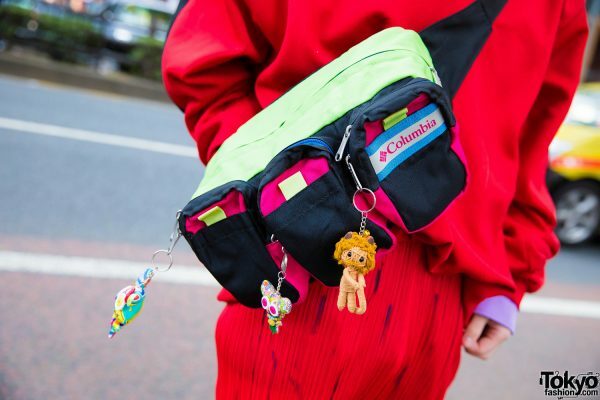 Blond hair and a Columbia multicolored fanny pack adorned with several keychains finished off his look. Syozo names Comme des Garçons as his favorite fashion brand. Finally, Rino stepped out in a vintage red hooded jacket over a dress from H&M and a white lace top from Yummy Mart. 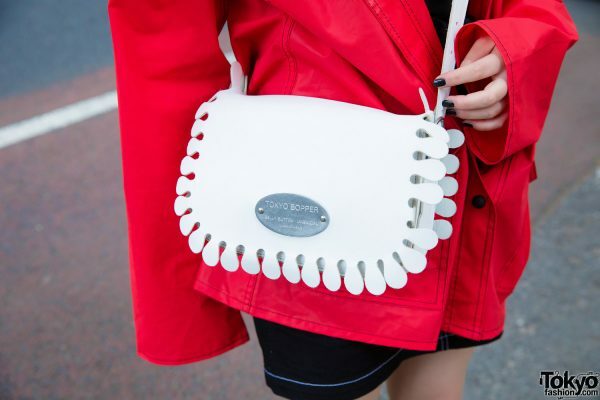 She styled them with white lace-up combat boots from Dr. Martens and a white bag from Tokyo Bopper. 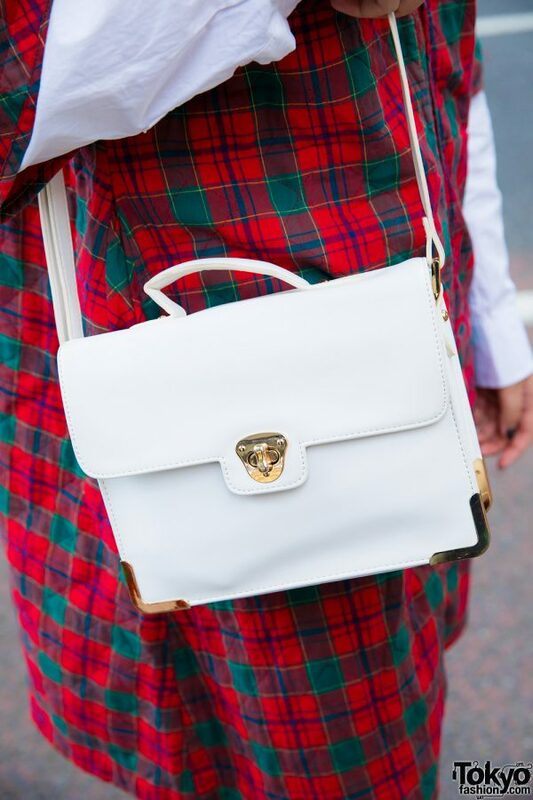 Red lips, black nails, and vintage accessories provided the finishing touches to her look. Rino lists Tokyo Bopper and M.Y.O.B. 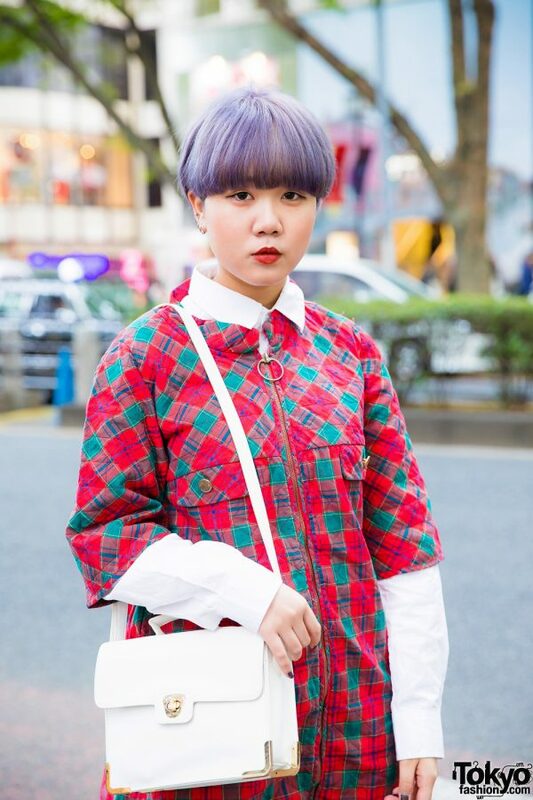 NYC as her fashion favorites, and she enjoys listening to music from Sheena Ringo and Suchmos. Follow her on Instagram for her social media updates.